Word is out in Hoboken this weekend about Mayor Ravi Bhalla's newest backroom developer deal for the downtown hotel and it's going to kick up a storm. Remember the original "needle" style boutique hotel proposal languishing for years? Finally, it was approved as a 17 story building and applauded by the construction unions who spent tens of thousands of dollars at the close of the ugly mayoral race last year to push Ravi Bhalla over the line. Those tens of thousands don't include the millions in free publicity when the Bhalla terror flyer landed to help him eek out a win with 32% of the vote. hotel developer, his union friends and would-be friends who would see $3 million to quiet the outrage. The downtown hotel suddenly rises another three stories and increases density 20% as part of Ravi Bhalla's latest deal. Now the hotel, a previously thought done deal is getting a pro-developer, pro-union boost. It will magically jump another three stories to 20 with 20% more added density and unions will get labor work for building it with a plus. Labor after completion is believed to also include mandatory union employee positions. But that's not the only kicker. To soften the public, activists and post-backroom deal resistance which will not swallow easy the sudden pro-developer winnings, a three million dollar kickback, uhm, benefit is proposed handed over to the local school district and the defunct uptown Y. They would receive one and two million respectively with the new Ravi Bhalla backroom deal lacking any public process or transparency. 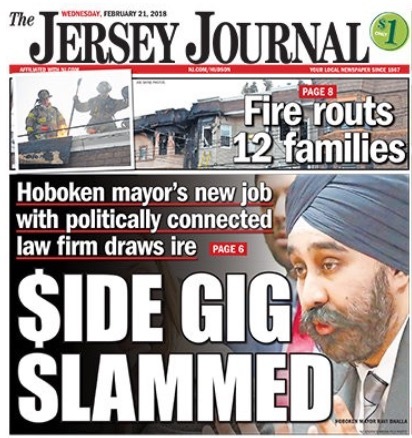 Who do you think will be miffed most in Hoboken? You can start anywhere. It will be a lengthy list. The public school district annually currently receives millions in Abbott district aid earning Hoboken lots of scorn statewide. The local Y closed its doors years ago and has rebuilt to house people trying to reintegrate into society while its exercise facility closed suddenly leaving disappointment in its wake. How is this three million windfall to be accounted for and benefit wider Hoboken? There will be some very unhappy non-profits in Hoboken who feel they've been jacked again ala the conflicted Bhalla Chief of Staff John Allen who lobbied for EasterSeals to get a rental office in town at next to no cost for a decade. The local fundraising school district group, Hoboken Public Education Foundation is already celebrating the backroom unannounced deal like they won lotto. Their weekend release from the Hoboken Public Education Foundation is below. The Charter Schools will benefit zero and are among the first to hear the bad news of the latest Bhalla backroom deal. Earlier this week, we met with Mayor Ravi Bhalla who shared with us an amazing opportunity for Hoboken and our organization. In addition to the major plans to transform the former YMCA building into a new community center with a brand new community pool and recreation facilities, an uptown branch of the Hoboken Public Library, and dedicated classroom space for early childhood education, the Hoboken Public Education Foundation will be receiving a $1 million payment to create a permanent endowment to provide financial sustainability for our non-profit organization. We began our journey with the Hoboken Public Education Foundation three years ago, when our own children were just beginning their experiences in the Hoboken Public Schools. We wanted to build a volunteer organization that would allow our community to contribute private funds on a tax beneficial basis, something very common in the New Jersey suburbs and New York City, but completely absent in Hoboken. With the help of our volunteer board, sponsors and each of you, we have raised $450,000 since inception. Never in a million years did we imagine our organization would have the impact it has on behalf of our children today. This $1 million negotiated by Mayor Bhalla will help us make even more investments in our public school district through innovative programs, improved facilities, essential technology, professional development, and much more. We, like many of you, are committed to raising our children here in Hoboken for the long term. Right now, we are on cloud nine that this project will yield so many benefits for our kids. This is an incredible win for Hoboken! And, it's funded by givebacks Mayor Bhalla negotiated from the developer of the downtown hotel project - not by taxpayer dollars. But here is where we need your help. We need the full support of the City Council Members in order to make this vision a reality for Hoboken. Our understanding is that some may vote No to this endowment. Join us on Wednesday, October 17 at 7:00 pm at City Hall (94 Washington Street) to strongly urge the Council to approve Mayor Bhalla's plan for the YMCA and our schools. We know that you are all busy, but we also know that we cannot do this without you. If you can only commit to one task, please do your best to join us on October 17th to ensure the City Council hears from our constituents and votes Yes. We can't let this opportunity slip by. We hope you'll let your voices be heard n support of this once in a lifetime opportunity for Hoboken. Talking Ed Note: How many parent votes can be bribed with a million? Ravi Bhalla is banking on re-election with their votes even if Hoboken's woeful infrastructure among many other needs gets ignored in the process. Since his path to get Albio Sires' congressional seat isn't looking too good currently, he may be stuck in Hoboken for a while. This will grease the wheels for his developer, union and select non-profit friends. Stay tuned. This is one backroom deal sure to generate plenty of anger from the Hoboken public.